Moisture regulative, priming, intermediate and finishing coat for wooden frames and wooden parts with limited dimensional stability. For exterior and interior use. Free of aromatic hydrocarbons. Moisture regulative enamel system for windows. Suitable as priming, intermediate and finishing coat. On folding shutters the use of Capadur Color Wetterschutzfarbe is recommended, due to the oftentimes adverse constructional conditions. Do not apply on timber framing or wooden facades. 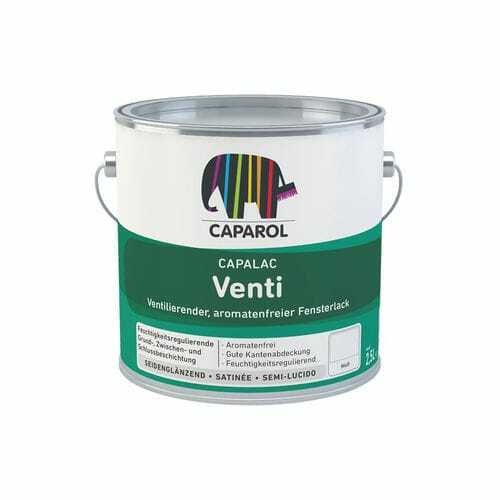 Due to the product typical odour, the use of Capacryl PU-Satin is recommended for extended indoor applications. Resistant to normal household cleaners and short-time resistat to weak acids and alkalis. Alkyd resin, solvent based, free of aromatic hydrocarbons.